Sympodium sp.- Blue/Green Sympodium – 3/4″ StockFrag – One of the least commonly seen of the Xeniids, Sympodium is a colonial species with lots of closely-set polyps on a dense substrate. With it’s deep blue center and greenish pinnules, Sympodium is distinctive and beautiful in both growth and color. Although primarilly photosynthetic, it migh benefit from supplemental feedings of foods designed for filter feeding invertebrates. Although adaptable in its environmental tolerences, we have found that this species seems to do best with moderate to bright light and water movement. 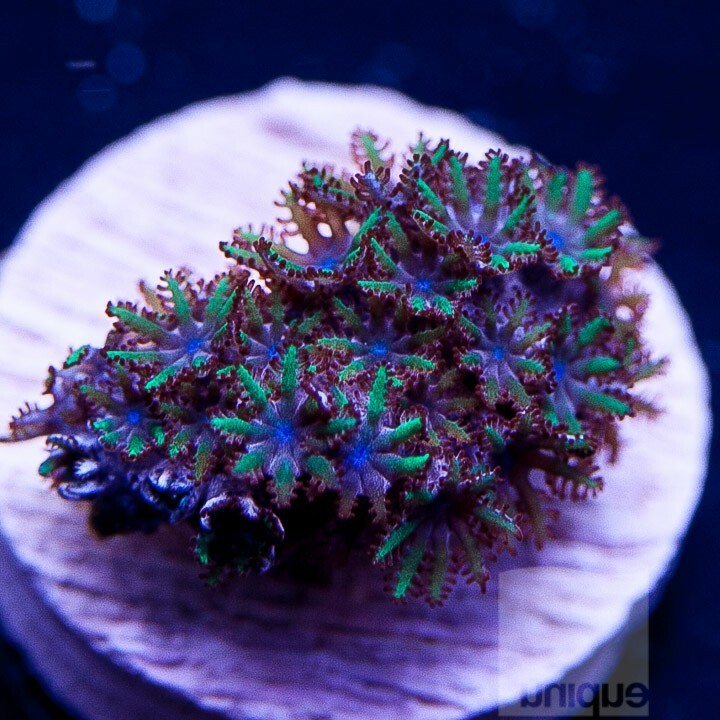 If you are a collector looking for something truly different in a soft coral, this is the one for you! SIZE: Approx. 3/4″ NOTE: You will be purchasing a coral similar to the one in the photo. Because we spend less time photographing and uploading “stock” items, we pass the savings on to you! If they are on the site, they’re always ready to ship!